Cave Run Storytelling Festival. Enjoy America's best loved storytellers in a beautiful mountain lakeside setting. Let these talented artists take you away to other times and places through the intrigue of storytelling. Stories will be told in large tents on the shore of Cave Run Lake at the Twin Knobs Recreation Area in the Daniel Boone National Forest located eight miles west of Morehead, Kentucky. 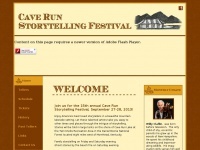 The web server used by Caverunstoryfest.org is located in Provo, USA and is run by Unified Layer. There are many websites run by this web server. The operator uses this server for many hosting clients. In total there are at least 104 websites on this server. The language of these websites is mostly english. A Nginx server hosts the websites of Caverunstoryfest.org. XHTML 1.0 Transitional is used as markup language on the webpages. To analyze the visitors, the websites uses the analysis software Google Analytics. The website does not specify details about the inclusion of its content in search engines. For this reason the content will be included by search engines.